Dance Foot Injury – Does pointe work cause bunions? There is no single cause of bunions which occur due to a complex interaction of many factors. Due to structural reasons related to bone shape and joint stability, some people are predetermined to get bunions regardless of their footwear and activity choices. What can be influenced is the rate and severity of bunion formation. Dancing ‘en pointe’ involves concentrating the body’s weight over the big toes and compressing the joint between the big toe and the foot. 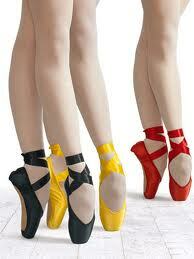 This can create additional wear and tear, particularly if the dancer’s shoes are poorly fitted. Shoes of an incorrect size or style will allow the foot to ‘sink’ into the shoe, crushing and malaligning the toes. A well fitted dance shoe keeps the toes and metatarsal bones of the forefoot in alignment whilst on pointe, reducing the chance of damaging angulations occurring within the joint. In some cases, a toe spacer is used to assist alignment within the shoe. Such toe spacers can be custom made by a podiatrist and are generally not required for other activities.